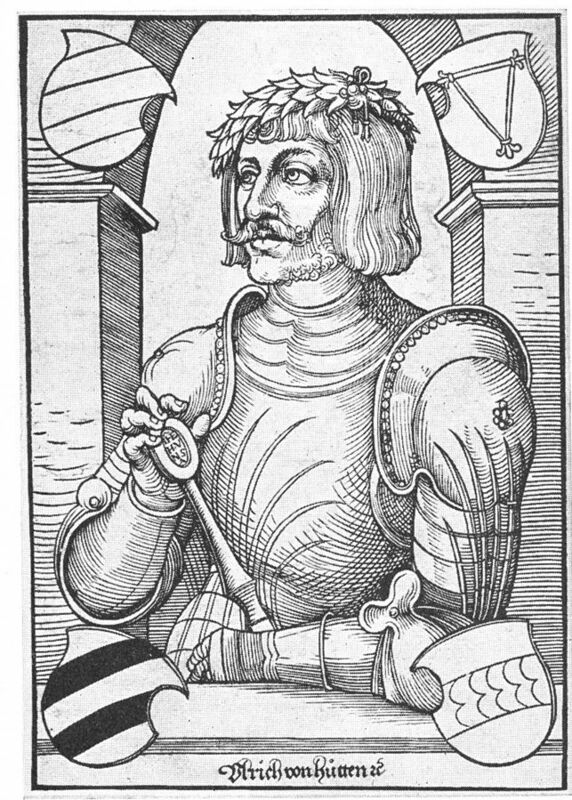 German patriot, poet, knight, classical scholar, satirist and Renaissance humanist. Hutten was a contemporary of Rabelais and Paracelsus, and was a key figure in the German Reformation. He allied himself with Reuchlin, Erasmus, and particularly Luther, in the battle to free Germany from the yoke of Rome. He published Luther’s works and Lorenzo Valla’s refutation of the “Donation of Constantine” as well as his own attacks on the corruption of the Church and its political thralls. His efforts to unite the German nobility and free cities against the tyranny of Rome and the corruption of the princes and the clerical benefice-hunters ultimately failed, and he was forced to flee the country to Switzerland. He took refuge in Zurich with Zwingli, the leader of the Reformation movement, where he died at the age of 41, of syphilis.